Apoxie® Sculpt combines the features & benefits of sculpting clay with the adhesive power of epoxy! Its smooth, putty-like consistency is easy to mix & use. Self-hardens (No Baking); cures hard in 24 hours to a semi-gloss finish. Adheres to nearly any surface. Works great with texture stamps, molds, paints, stains, mica powders & more for additional creative styles. Great for sculpting, embellishing, bonding & filling most anything. Discover the Unlimited Uses! 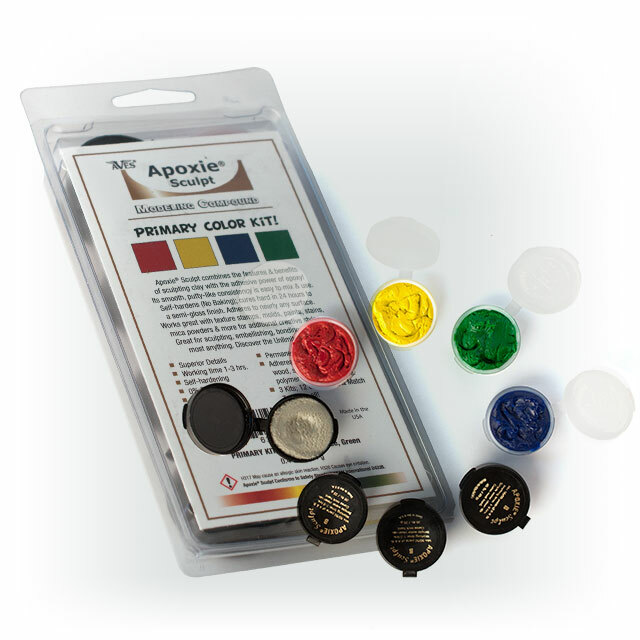 We make 12 different colors of Apoxie® Sculpt that you can mix & match plus Super White Apoxie® for more color blending options, check out our PDF color mixing guide for more color ideas! These color kits are simply our pre-colored Apoxie Sculpt sold at a great price for 4 colors in a kit. Each color is available in larger sizes (see Apoxie Sculpt product page to order larger sizes). Color Kits come with 4 pre-designated colors described above. Each color set includes parts A & B and are 1/10th lb each color set. (4 color sets per kit) for a total packaged weight of 0.4 lbs./184g. 3 Kits; 12 different colors of Apoxie® Sculpt that you can mix & match with Super White Apoxie® for more color blending options. Adheres to: Itself (in any stage of set-up before or after curing), other epoxies, ceramic, metal, wood, stone, glass, plastics, polymer clay, foam & more. Apoxie® Sculpt is ready to use; working time is 1- 3 hours. Shape as desired. Smooth or texture with a wet finger, brush, Q-tip or sculpting tool. Self-hardens (NO?BAKING); 24 hour full cure. WARNING – May cause an allergic skin reaction and eye irritation. Hazard Statements – H317 May cause an allergic skin reaction. H320 Causes eye irritation. Apoxie® Sculpt Conforms to Safety Standard ASTM International D4236. Unlimited Uses for the Multi-media Artist! Sculpting, Embellishing, Jewelry; Manufacturing; Stone Setting; Arts & Crafts; Antique Restorations; Mosaic & Glass Art; Home, Toy & Doll Repairs; Scenery Applications; Woodcarving; Taxidermy; Model Making; Prototypes; Casting; Aquarium Customization; Outdoor Projects and much more! *Can be seamlessly feathered before set-up with a paint brush and the use of Aves®Safety Solvent for fine details; use water for smoothing large surface areas of your project. *Dipping your tools & fingers in cold water will keep Apoxie Sculpt from sticking to your surfaces and allow maximum details. Apoxie® Sculpt can be tinted with paints or pigments to match/create a desired color (adding pigments can alter products original consistency). Works with texture stamps & molds! Apply paints, stains, mica powders, gold leaf, paper transfers and more for a variety of finishing options! Available in 12 colors + Super White Apoxie® mix & match for unlimited coloring options. Just download a free PDF Color Mixing Chart! Create an unlimited possibility of colors using simple 1:1 ratios. *A good idea for any left over mixed Apoxie Sculpt is to start a journal cover or decorate a box top with it – you’d be surprised how much you over mix and how creative you can be with your left overs!